A well-known characteristic of the betta fish is fighting, according to Animal Diversity Web. Often, betta fish do not live in harmony with other creatures. While female bettas are typically less aggressive than males, each fish has its own personality. Finding a tank mate -- or mates -- may require trial and error. Take the betta out of his tank and place him in a holding tank. Float the bag containing your new fish in the aquarium water for a couple of hours. Then, add them to the tank while it's dark and allow them become familiar with their new surroundings. Put the betta back in the tank the next day. Generally, he will consider the new fish part of the tank and ignore them. 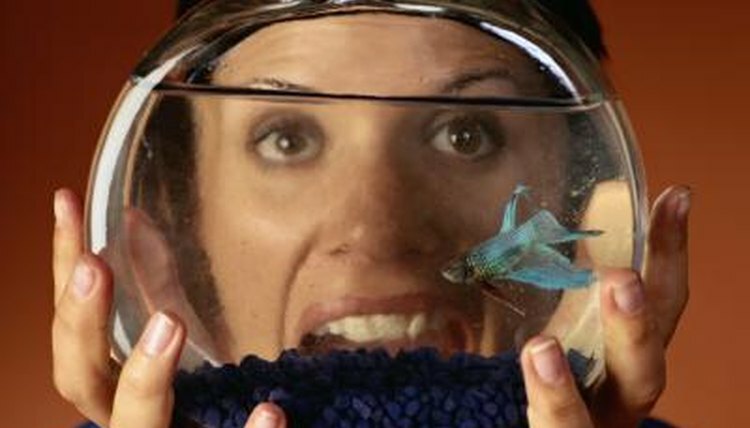 However, keep an eye on them for a few hours and make sure your betta does not become aggressive. Non-fish mates may be added to the tank in the same manner. Two types of catfish live well with bettas: otoclinus and corydoras, also known as ottos and corys. Both species of freshwater catfish are bottom feeders who remain small in stature and move fast, staying out of the betta’s area. Occasionally, the corydora comes to the top of the tank and gulps an air bubble from the surface, according to the University of Florida website. These dull-colored fish tend to thrive in groups of four or more and enjoy the warm water temperature the betta requires. Adult neon tetras add color to a betta tank. They hang around the middle of the tank and are quick movers. They prefer larger schools and thrive with 10 to 12 members in their group. Tetras, like bettas, prefer warm, soft water and plants, which offer a protective cover from bettas, in their aquarium. The shy, reclusive pleco often makes a good tank mate for the betta. Like the bottom-feeding catfish, they tend to hang around the bottom of the tank away from the betta. Plecos feed on algae and help keep the tank clean. While the common and gibbiceps pleco species may live with bettas, they grow larger than the bushy or bristlenosed pleco and generally require larger tanks. If your betta refuses to live with another fish, consider getting him a non-fish tank mate. Apple snails, African dwarf frogs and ghost or cherry shrimp are alternative tank mates for bettas. When choosing shrimp, pick the larger ones at the pet store, so they have a better chance of surviving in the tank and not becoming dinner. Japanese Fighting Fish: What Fish can Live with Bettas?